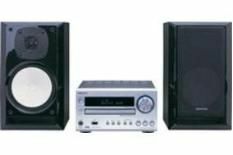 Onkyo CS-525UKD review | What Hi-Fi? If you don't like spoilers, you might want to skip this introdction… then again, regular readers will be aware of what has previously come to pass: Onkyo and Denon both brought out brand new micro systems within a few days of each other in 2008 and, sadly for Onkyo, it was the Denon D-M37DAB that comfortably took the spoils and, a month later, the Product of the Year crown. In terms of form and function, the CS-525UKD has a similar style to its predecessor, the '515, but added a USB input on the front of the unit. There's still a headphone output alongside stereo inputs and outputs, and a 3.5mm minijack output. There's also a dedicated iPod dock connection on the rear of the unit (the DS-A2X costs £60) and the speakers have had a glossy redesign. Navigating the machine has been made easier thanks to the removal of the twisting control knob for skipping tracks in favour of individual ‘forward' and ‘back' keys. The chunky remote does a job but doesn't fit in with the style of the rest of the system. Listening to the hotly anticipated and predictably underwhelming Chinese Democracy album from Guns N' Roses, the Onkyo reveals plenty of detail as it delivers an open, spacious sound. Kanye West's Robocop shows this system is capable of hitting high frequencies as well as it can reach impressively low bass notes.A very promising start, but prolonged listening turns up a few small issues that start to bug us. Listening to A Tribe Called Quest's Buggin' Out, the track doesn't quite have the flow we're used to, with the lazy rolling bassline lacking pace and punch, sounding a little soft. More pertinently there's a lack of balance to higher frequencies, with vocals at times sounding a touch muffled while other treble sounds display some brightness. Switch to the tuners and the Onkyo is strong and reliable, picking up the necessary stations and demonstrating clarity and stability with DAB and FM. While undoubtedly an enticing product, sonically this Onkyo doesn't quite match either its admittedly brilliant predecessor or the new kid on the block from Denon – which can only mean four stars.